After two long hours of tease this past February, followed by a few fleeting glimpses in May, Sony's finally ready to show us what its next-generation PlayStation console actually, you know, looks like. And it's... well, it's a rhombus. A familiar-looking one. "It is a design that is sleek and visually impactful wherever it is placed," said Andy House, President and CEO of Sony Computer Entertainment said during the reveal. And that's probably true, or at least, it's fair to say that the PS4 isn't any more obtrusive than the PS3 was. But it still looks a bit bulky at first glance, like an onyx coffee table book that you keep propped up by your television. If anything, it seems to take up even more of a footprint than the PS3, although it's hard to say based on the brief glimpse we got of the console on the stage. Maybe more fair to say that it looks like an evil Wii, or a more genteel 2001: A Space Odyssey monolith. But there have been plenty of other question as well around the PS4, beyond the obvious what does it look like and how much does it cost. Especially given the angst around the Xbox One's treatment of used games and mandatory internet connectivity, how the PS4 treats those same issues will have serious reverberations throughout the gaming community. We at least now a little more about Sony's content strategy: Sony's Video Unlimited service will be available from Day One on PS4, with a catalog of 150,000 movies and TV shows available to rent. Music Unlimited, with over 20 million songs that can be accessed from PS4, Android, and iOS will be available as well. The usual suspects like Netflix will be there as well, in addition to newcomers like Redbox. And Flixter will be added this fall. None of this really differentiates the PS4, though, which might be fine. 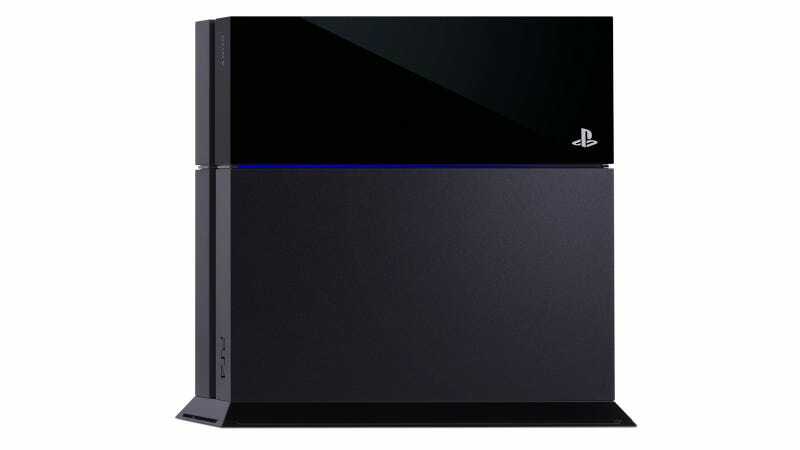 Sony's been positioning the PS4 as a gaming console, a counterpoint to Microsoft's Xbox One living room takeover. It's a good strategy on paper, but also implies that the Xbox One doesn't have any gaming appeal. DRM issues aside, that's a dangerous bet. Speaking of games, Sony had at least one major exclusive to announce for PS4. It's a steampunk romp with (big) guns and (scared) horses. There is shooting, there are bad guys, there are intentional anachronisms aplenty. It's called The Order, and while it might not be worth buying a PS4 specifically for, it definitely looks dope. Other games? There are other games. There's Drive Club, a racing game. Infamous: Second Son, a sequel. Transistor, which, okay, that looked awesome. Sony played up indie developers as well, highlighting everyone from Tribute Games to Young Horses to Switchblade Monkeys to Ragtag Studios. Yes, that means Octodad. And every single one of them will be making an exclusive debute on PS4. Although "debut" is different from "lifetime." Maybe the biggest get, though, is Final Fantasy XV and Kingdom Hearts III, both of which appear to be PS4 exclusives. Fairing less well was an Assassins Creed pirate varietal (Assassins Creed IV: Black Flag), that somehow—aside from a few robust explosions—made both pirates and assassins seems dull. We also saw a demo of Watch Dogs from Ubisoft, another game that's not a PlayStation exclusive. Which is fine; sharing is caring. But Sony spent a long time during its keynote showing off games that you could get elsewhere. Well, that looks okay. But in motion? It looks silly in motion. Not necessarily more silly than it would on an Xbox One. But... still. Sony also highlighted a new Elder Scrolls entry, which will include an exclusive PS4 beta. Which speaks to the problem a lot of Sony's PS4 exclusives have: They're not really all that exclusive. A little downloadable content here, some beta action there. Overall, though, there aren't that many titles that you're going to want to buy the PS4 for. The graphics all look, for the most part, stellar; but if I told you they were on the PS3, you'd believe me. That doesn't mean much; it takes developers a while to take full advantage of a new console's hardware horsepower. But if you're looking fora leap forward in graphics right away, you'll be... well, not disappointed. But you'll slow nod instead of slow clap. There are over 140 games in development currently for the PS4, including 40 that include "experiences" that are exclusive to PlayStation. Note, again, that "experiences" don't mean the full game. If you're watching the livestream, don't worry. They're better than that, easily. In fact, the graphics are definitely more impressive in person than any picture or stream of them you've seen so far. We had already known quite a bit about what Sony's first new console in seven years does; the graphics are sublime, games boot "instantly" from sleep, games download in the background. And we know what's in it: an x86 processor, an 8-core combined CPU/GPU, , 8 GB of unified GDDR5 memory (versus the PS3's 512 megabytes), a local 500GB HDD. Sounds good! But tonight Sony made much ado about the facial rendering capabilities driving the games of the future, showing the PS4 in action. Specifically, it showed a cut from a "12-minute demo" (awww you sure you can't show the full thing?). Again, it looked very good, but we haven't left the uncanny valley by any means. Also worth noting: From what we've seen so far, it's probably safe to say you can find comparable graphics on the Xbox One. So this is really more of a "next generation" demo than a PS4 demo. Microsoft, by contrast, limits your ability to sell used games in a way that many in the gaming community felt onerous. Another counterpoint to perceived Microsoft tyranny? The PS4 doesn't need to connect to the Internet ever 24 hours, or ever. The Xbox One, by contrast, requires the system to be connected to the Internet periodically. Likewise, your PlayStation Plus membership will carry over from the PS3. Oh, and while Sony didn't mention this, it's worth mentioning that you also don't need to buy an expensive accessory (ahem, Kinect) along with the console. While you could see this as a major counteroffensive on Sony's part, there's every possibility that the PlayStation would have come with these features regardless. Microsoft's Xbox One position, for better or worse, was unprecedented in the video game world. This is just a reminder of the status quo. The PS4 is going to cost $400, and will be available "this holiday season." That puts it at a hundred dollars cheaper than the Xbox One, although it's worth remembering that the Xbox One comes bundled with a Kinect 2. It's an aggressive price, though, one that Sony needed to hit to make itself an attractive Xbox One alternative. If nothing else, the choice is clear: Do you want a living room portal that happens to play (some extremely good) games? Or a less expensive gaming machine (with some extremely good online content) that doesn't have much of an exclusive identity? For the gaming community, the edge pretty clearly goes to the PS4 right now. Used games aren't tainted by DRM restrictions, the console itself is cheaper, the graphics are sublime. The question is: What about everyone else? We'll have to wait until the holiday season for any sort of definitive answer.